We arrived at the airport pretty early that day as we wanted to enjoy the Iberia Lounge but we were a bit too early. So we had to wait for about 40 minutes before LATAM opened the Check In. In the meantime we sat down at a large window front to hear some music and chill. Three Iberia A320-family members were standing at the stands and as one was pushed back, I saw that it was EC-LEI, the aircraft that brought me from Madrid to Frankfurt in 2015. So I took a "few" photos and after that we checked in and went to the really luxurious and spacious security check. Madrid did that very well in separating eco-passengers from business class-passengers as they had a extra room just for business class. As we would deaprt from Terminal 4S, we had to take the train from T4 to the satellite terminal. From there we went through the duty free area into Iberia's lounge. That's one thing that I don't like about this lounge. You have to go into a duty free shop to enter the lounge...that's just stupid. The lounge itself is phenomenal. You have a clear view over the eastern part of the apron and a good view onto runway 14L/32R. On that day runway 32R was active so all aircraft exit the runway in front of the lounge. The food was pretty good but the variety was not as good as I thought. Next to a huge seating area Iberia offers a gaming corner, a working room, massive toilets and showers as well as a cafe and a sleeping room with really comfortable couches. We had a good time in there with some nice traffic taxiing next to the lounge (Emirates A380, American A330 & Iberia A320neo). Right on time we left for our gate S40 where our LATAM Dreamliner already stood. 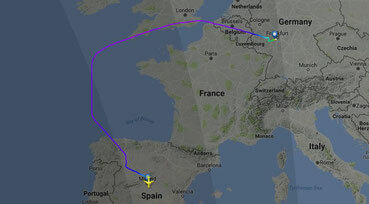 It was the same aircraft that we flew to Madrid one week earlier, CC-BGB. A short clap onto the aircraft skin and a few moments later I sat down on my seat 3L. This time, nobody sat next to me. When reaching our cruising altitude of only 37.000 ft, the flight attendents gave us our meal. 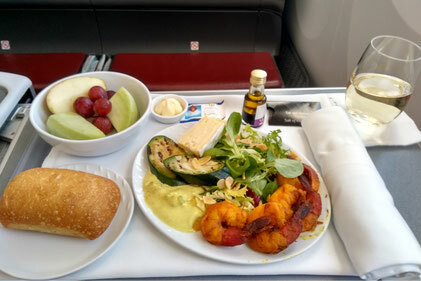 Shrimps with pine nuts salad, grilled cucumber, a piece of camembert, bread, some fruits and a piece of chocolate. With that I chose a chilean white wine which tasted really good. Somewhere over the atlantic I played a few rounds of Sudoku on my IFE and talked a bit to my friend who was sitting behind me. It was such a chilled flight after a wonderful week in Madrid. Flying business class is so relaxing, you have enough space and good meal. Later we hit the english coast over Plymouth and as we flew along the coast I finally saw Eastbourne and Brighton again where I was on vacation in 2012. Our captain announced that on the left side London was in sight and a few moments later a flight attendent came next to me with her mobile in her hand to show me a video from the cockpit and a nice view of London. I think she saw my camera and my suction cup on my window and thought that I may be interested in this :) She guessed right. I also took the opportunity to ask her if there was a chance to go into the cockpit after landing. As you can see on the map below we basically got a free flight from London to Frankfurt as this is the exact routing of all LHR-FRA flights. 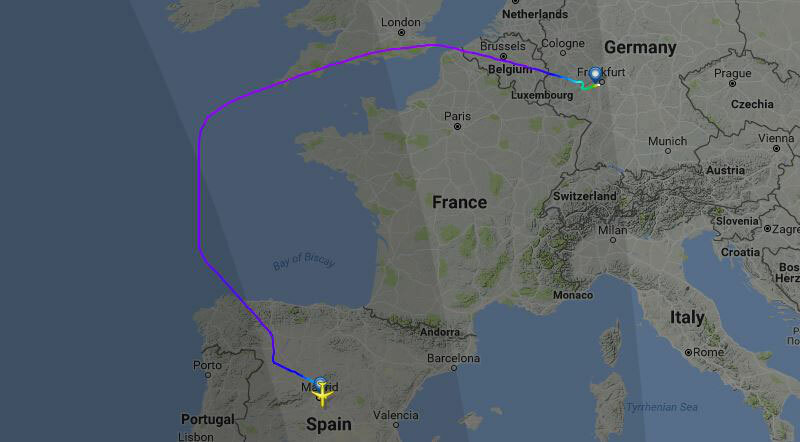 We flew around france as there was an ATC strike in these days. Over Belgium we started the descent. 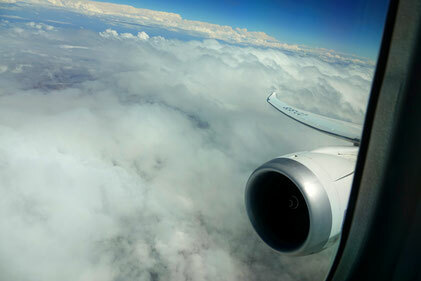 Because of winds from the east we approached from west which decreased our delay. With two sharp turns we aligned on the ILS for runway 07L and landed smooth, safely and with good memories. About ten minutes of taxiing and then we turned into gate B42. When everyone was exiting the aircraft, we waited for our second cockpit visit in this aircraft. Both pilots welcomed us warmly, the first question of the captain was if we were argentine. As we asked why he told us that Argentinia lost against France in the worldcup. Our SFO told us that he was 25 years at the navy before he joined LATAM as a 787 copilot six months ago. After we took some photos we talked to both pilots for at least 10 minutes then we went of "CC-BGB". Maybe we will see her next year as we all want to fly back to Madrid and definitely again with LATAM in their gorgeous bsuiness class.